The All Whites have delivered their best performance of the HERO Intercontinental Cup, defeating tournament hosts India 2-1 in hot and humid conditions tonight in Mumbai. Fritz Schmid’s side, who came into the game knowing their best chance of making the final was to upset the World No 97 in the fever-pitch conditions, turned on a performance of composure and character to claim a valuable three points. 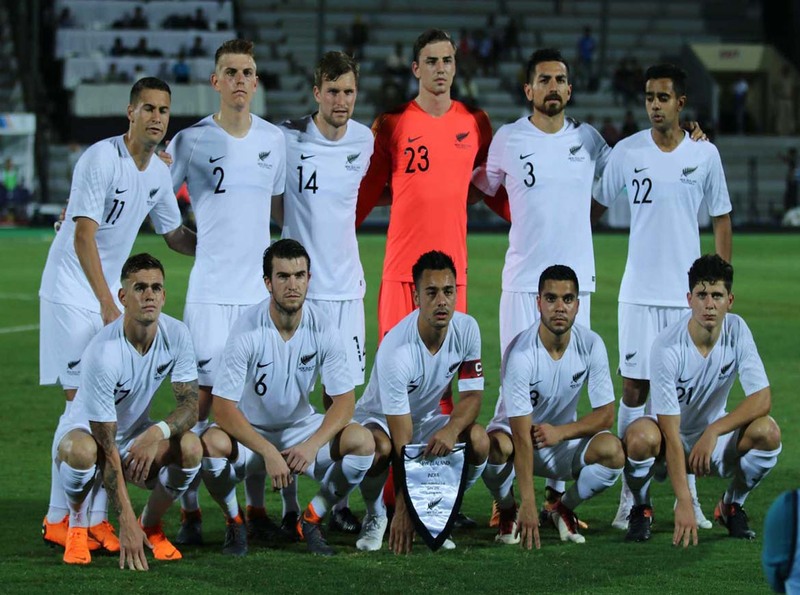 After this young All Whites team made history on Tuesday with New Zealand’s first win over non-Oceania opponents since 2015, they made further history and an even bigger statement with their first back-to-back wins against non-Oceania opposition in 12 years. More importantly for this group was the fact that the win kept them alive in the tournament and a good chance of making the Intercontinental Cup Final on 10 June. If Kenya defeat Chinese Taipei by three goals or more in the final pool game tomorrow then they will advance, otherwise the All Whites will make the final and it will be a rematch of tonight’s entertaining contest. The World No 120 New Zealand, led by the excellent array of attacking skills of Sarpreet Singh, who again was named man of the match, completely dominated the first 45 minutes, but went into the sheds with nothing to show for their ascendancy. The All Whites could have scored on a number of occasions as their pace and movement caused India all sorts of problems. After the break, India took the lead in a forgettable mix up. Seventeen-year-old left back Liberato Cacace delivered a pass back to debutant goalkeeper Michael Woud and the Sunderland’s keeper clearance ricocheted off the Indian skipper Sunil Chhetri’s body and into the back of the net. It was a cruel way to concede but the young All Whites side wasted little time on that moment. Two minutes later, Singh was straight back onto the ball and threaded a nice pass through to Andre De Jong, who started for the All Whites for the first time, to slot home for the equaliser. Moments earlier, the sold out Mumbai Football Arenas was raucous with noise, but all of a sudden it was quiet as the New Zealand team gathered around De Jong to celebrate his milestone. The son of former All White Fred got the visitors back in the game. There was more to come as the All Whites kept pouring forward and an unlikely All Whites goal scorer would secure the win. Midfielder Moses Dyer, who was the last of the 23 members in the squad to take the pitch during this tournament, came on as a second half substitute to steal the show in the 85th minute. Dyer received another beautiful ball from Singh in the box and hit a shot that was partially saved by the Indian keeper Amrinder Singh. It took an eternity to cross the line but when it got there the All Whites were celebrating as a squad. It was Dyer’s first goal in his 11th international for New Zealand. It was a deserved lead and one that New Zealand would hold onto to record a memorable win and this young group came of age just a little bit more. Schmid made four changes from the team who defeated Chinese Taipei on Tuesday night. Defender, and captain for this tour, Thomas Doyle was ruled out with a groin injury. Woud, Tim Payne, Sam Brotherton and De Jong all came into the starting XI in place of Nik Tzanev, Doyle, Te Atawhai Hudson Wihongi and Henry Cameron. Woud, the 19-year-old keeper from the Sunderland, made his international debut, De Jong started for the All Whites for the first time and Cam Howieson led the team out for the first time. With tiring legs in the second half, Schmid brought on Hudson Wihongi, Matt Ridenton, Adam Mitchell, Noah Billingsley and Moses Dyer on to close out the game and none had more impact than Dyer. The All Whites will rest and recover tomorrow and see what the outcome of the final game between Kenya and Chinese Taipei to learn if they have done enough for a place in the HERO Intercontinental Cup Final.